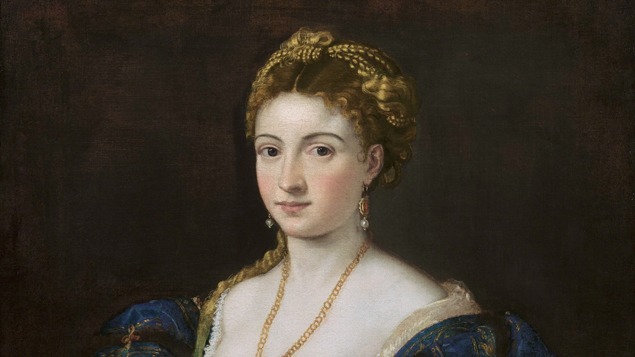 “Presented by arte italia, through its relationship with New York-based Foundation for Italian Art & Culture, Titian’s Renaissance masterpiece painting La Bella: Woman in a Blue Dress will be exhibited in the Museum’s E. L. Wiegand Gallery. An expanded exhibition of Titian’s life and art is on view through Titian’s Venice at arte italia located at 442 Flint Street. The most celebrated artist in Renaissance Venice, Titian is unsurpassed as a portrait painter and member of the 16 Century Venetian School. One of his most iconic artworks is the single masterpiece popularly known as La Bella, the beautiful woman. The luminous painting is a classic portrait of a beautiful woman in a magnificent dress and luxurious accessories of the day. La Bella’s blue gown is accented with gold embroidery with ruffles at the neckline and cuffs, and gold, ruby, and pearl jewelry accents her elegant presentation. The painting was first commissioned by Francesco Maria I della Rovere, Duke of Urbino, a mercenary military leader. In 1536, the duke sent a letter to his agent in Venice inquiring about the progress of “”that portrait of that woman in a blue dress,”” whose completion he eagerly awaited. The painting in question was doubtless La Bella, which is today in the collection of the Galleria Palatina in Florence. The canvas has been cleaned recently, and the removal of discolored varnish has revealed the splendor of the woman’s blue dress and the luminosity of her flesh. In 2010, the Museum featured Raphael: The Woman with the Veil and with La Bella visitors can continue their exploration of Italian Renaissance masterpieces. This exhibition is made possible by the Foundation for Italian Art & Culture. Founded in Reno, NV and operated by the E. L. Wiegand Foundation, arte italia promotes the exploration and conservation of Italian culture, including innovative exhibitions of classic Italian art and culinary programs featuring renowned Italian chefs.